LinkedIn. A platform many in the event industry thought would die a horrible death, has certainly come a long way in a short time. Around these parts, it is now one of the go-to platforms for sharing industry news and updates. We actually get geeked out when they roll out new features and one of the best recent features is video… think Facebook Live for the suit and tie set. At a client event just a few months ago, we watched an attendee record and post to LinkedIn where the video did well with over one hundred people watching during the conference and even more viewing since. 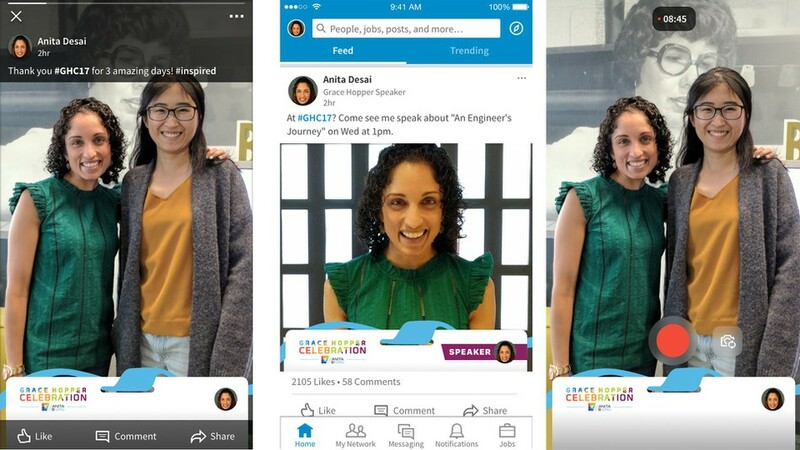 That memory alone made me stop and write this post when Dahlia shared today’s announcement (via Mashable) that LinkedIn is adding some very Snapchatish and Instagrammy GeoFilters to their video tools. I know what a lot of conference planners are saying right this second… “So what. No one uses Snapchat at our professional event and Instagram, meh, maybe a picture or two. This doesn’t matter to us” and to that I say, sure, I almost agree… but… this is not SnapChat or Instagram. This is LinkedIn. A platform that most of your attendees already use. They are familiar with it. What I get from the Mashable post is that these GeoFilters look like neat conference badges. This is good because it will boost the chances that one or more of your attendees will actually try it out. They won’t be scared off by filters with kittens, puppies, or unicorns. This is something a grown-up might think is cool on a business network. Although I am sure there is someone at LinkedIn saying “You know what would make this better? Ponies! Let’s add Ponies!”. Professional looking filter aside (even with ponies), you will not find a rush of Quentin Tarantino wannabes popping up at your event or conference to share cool vids of your dope sessions. Nope. Never gonna happen. What you will get are a few people actually giving it a go and that is certainly better than none, because, according to LinkedIn, videos are shared 20 times more often than other content. If you had zero video posts before, let’s go big and say you will get five now because your audience is filled with risk taking CPAs. While five may not seem like a lot, it might actually be huge, groundbreaking even. One person shares a picture from your conference and that picture gets shared 5 times. COOL! Using the 20x more shared theory, if they had shared a video, it might get shared 100 times. HOLY CRAP! That is 100 people who are seeing video from your event and we all know video is an amazing marketing tool. YES IT IS, KEITH, YES IT IS! Now what if 5 people shared a video that gets shared 100x each!! You figure out the math, I trust you. OMG!!! ALL THAT SHARING!!! LET’S DO THIS!!! Wait. Do I think that the 20x rate is actually a real number? Sure. For brands that are cool, hip, have stunt planes, fast cars, and cool fizzy drinks that give you wings. For most conferences and events? Hell no, but I am not soured on this idea if only because of what I saw at my client’s event a few months ago. But even that I think is skewed because that guy was one of the popular kids, he has like 10,000 connections on LinkedIn, so 100 views is almost a given. He is like the Beyoncé of Real Estate and that is not normal. But I do have hope. Yes, video is shared more than other conference content, you know, the drunk selfie, the off-kilter shot of a PowerPoint slide taken in the dark, or that one with half of Bob’s giant smiling head. We know that video gets shared more because we see attendee videos. I see the shares, I see the likes, and I see the comments. I see that video works for almost all conferences and events. I guess my point is this, we would be remiss to poo-poo this before it is out of the gate. There is still much to learn and there is still much not known. This feature is not out to the public yet and the first “official” event using filters is later this week. I do think that there is promise here. Cool tools from platforms we already use are always welcome so let’s see how this develops. Should you be keen on giving it a go when it launches, make sure you come up with a plan to educate attendees on what it is and how it works. Save them the frustration of having to learn on their own and you might just be putting yourself in a position to catch a win.